Prepare to be left breathless the first time you experience the thrill of the new SEAT Leon CUPRA, available here at Motorparks. This is because the well-known Spanish manufacturer has made its hot-hatch a raw, passionate and exciting vehicle to drive. Even when you are not behind the wheel of the 2016 SEAT Leon CUPRA, you can enjoy the sharp styling that ensures this car stands out wherever the trip from A to B takes you. Easy-to-spot dual exhaust pipes and an imposing central grill add to the eye-catching elements of the new SEAT Leon CUPRA’s exterior. 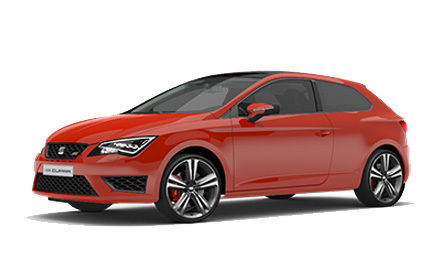 Make an enquiry about the 2016 SEAT Leon CUPRA online today, or book a test drive to commence at the Swindon Motor Park dealership. Have you also explored our huge range of used SEAT Leon CUPRA cars? There are some great deals waiting to be found.